Hello guys. The power was knocked out here for a little bit due to the wind, but nothing like what happened on the East Coast. I hope those of you who live there are doing alright. Sparkling Apple would be a favorite in this house. Sparkling apple happens to be my favorite, as well. Congratulations! I will be contacting you, so keep an eye out for an email. Hello friends, and happy Friday! I was given a head's up from IZZE Sparkling Juice yesterday about their ongoing contest, Hello Good, celebrating the good moments in life. 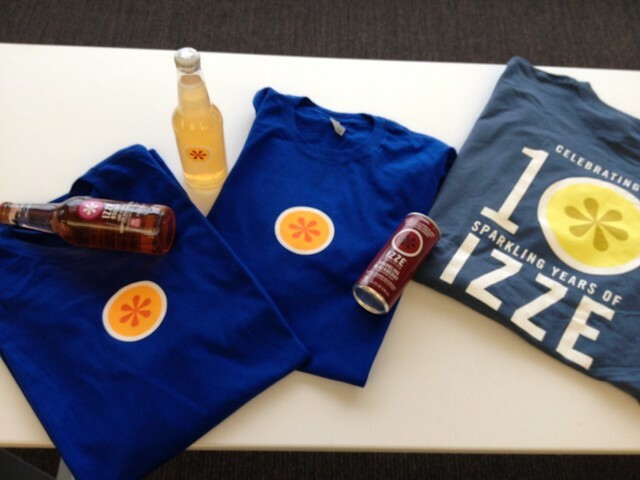 To enter, simply snap a picture of yourself enjoying your favorite IZZE beverage and submit it to the IZZE Facebook page. Upon submission, you'll receive a $1 off IZZE coupon, and you'll be entered to win free year's supply of IZZE! The contest runs through Sunday, with a winner picked everyday. You can enter everyday if you choose. Pretty nifty! Simply leave a comment and tell me what which IZZE flavor is your favorite. If you've never tried it before, tell me which you'd like to try. Winner will be chosen at noon on Tuesday. Open to U.S. residents only. 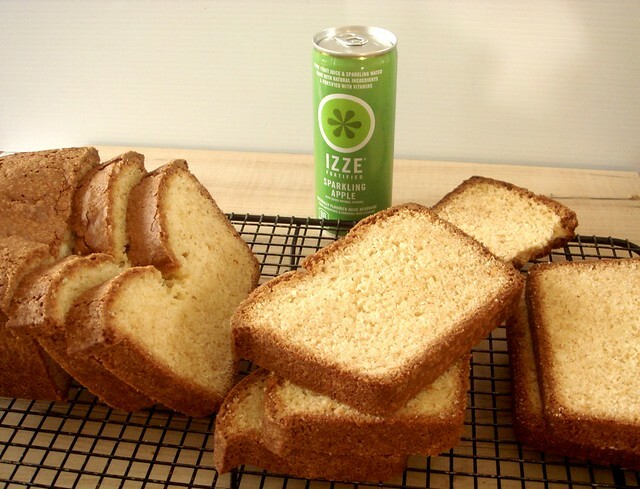 Since I was in the mood for IZZE, I went to the store to pick up a pack (using my own money) to guzzle and to bake. That's right, I baked a sparkling cake. Unlike the last cake I made with IZZE, this one is much more simple. 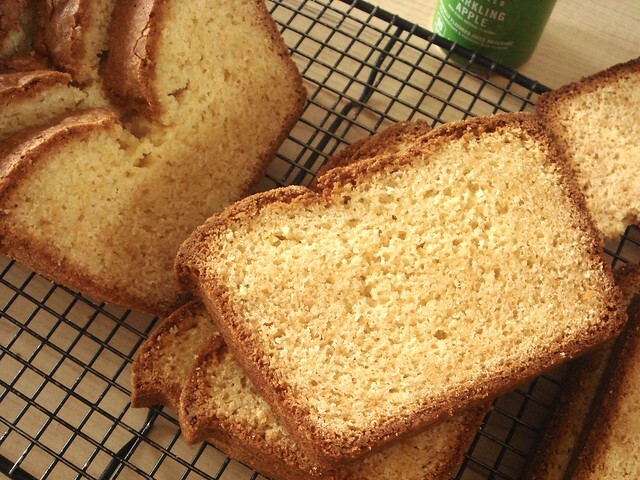 This hearty pound cake is perfectly snackable and doesn't have to be saved for dessert. I changed up the original recipe a bit, adjusting the sugar and leavening amounts as well as method of preparation, but it's mostly the same. Honestly, the apple IZZE isn't very pronounce. The cake does taste incredibly good, though. Recipe is after the jump. Preheat oven to 350°. Grease a 9-inch loaf pan well; set aside. Whisk flour, baking powder, and salt together in a medium bowl. Add eggs and sugar to a large mixing bowl. 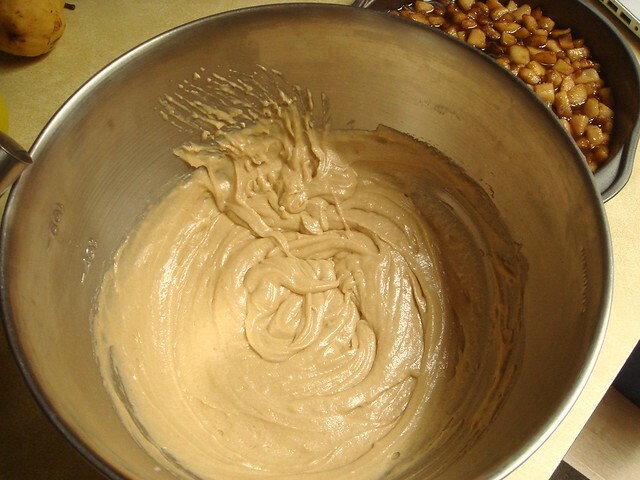 Using a mixer, beat on medium-high until mixture is pale and thickened, 2 minutes. Mix in vanilla extract. With mixer running, stream in vegetable oil until blended. Fold in dry ingredients, mixing just until a trace of flour remains. Pour in IZZE and fold into batter just until smooth. Pour batter into prepared loaf pan. Bake for 1 hour; cover top of cake with a piece of foil and continue cooking for 25 minutes. Remove from oven and let cool on wire rack for 10 minutes. Run a knife along the edges, then remove from pan. Let cool for another 10 minutes before slicing. up with Green Mountain on trips to Fair Trade farming communities. You'll be able to see behind-the-scenes videos of the trips and learn about the impact Fair Trade has on the communities. By watching the videos and participating in Fair Trade Month, you'll have the opportunity to unlock Fair Trade Certified Green Mountain samples and coupons and be able to enter to win a trip to a Fair Trade source country. Besides familiarizing myself with the Fair Trade coffee, I learned that 1.75 ounces of ground coffee makes an eight-cup pot. A little extra perk. 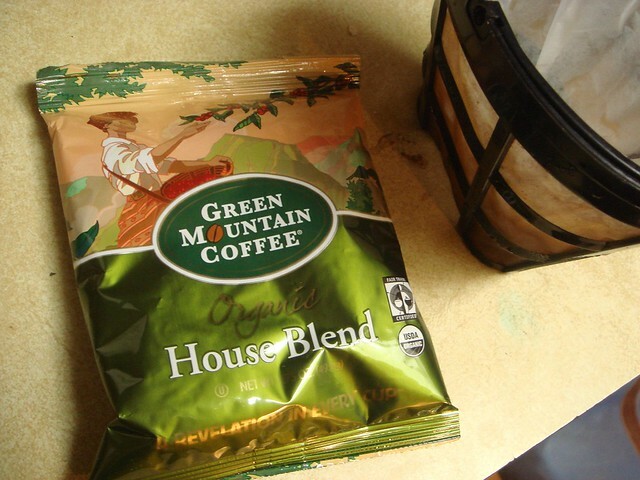 I've never tried Green Mountain before, and I always thought that they exclusively sold k-cups. The brewed coffee smelled like stepping in to a coffee shop, though I wasn't able to drink it black. Green Mountain's 'house blend' is a blend of medium and dark roasts, according to their website, and to me had a rather bitter taste. However, it was excellent with cream and sugar. Sometimes coffees become weaker when you add extras, but that wasn't the case here. Since I'm always looking for new coffees to try, I might try out another roast, or maybe their seasonal pumpkin spice flavor! Green Mountain Coffee is available in most grocery stores, stores like Target and Wal-Mart, and online at GreenMountainCoffees.com and Keurig. 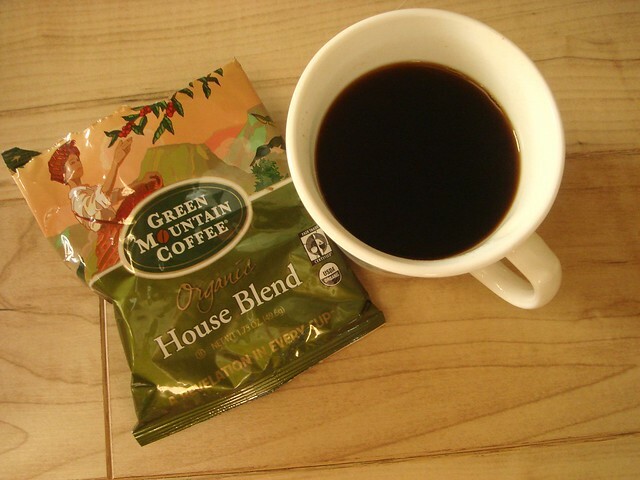 If you'd like a coupon for $1 off one 12-count box of Fair Trad Certified Green Mountain Coffee k-cup packs, or any 12 ounce bag of Fair Trade Certified Green Mountain Coffee, send me an email at christinaATrunningfoodieDOTcom, or message me on the Facebook page and I'll mail it out to you. Sometimes you make a recipe just once, either because it's elaborate and time-consuming, or because it simply wasn't very good. Other recipes are made repeatedly because the results are too fantastic not to make again. The latter category is where this cake falls. I first made it one evening after dinner when Alex requested a post-dinner snack. (A long run will do that to a person.) I immediately thought about a "French apple cake" because it's very quick and the kitchen was already clean. My search led me to this recipe from America's Test Kitchen. The only elaborate part is the apple topping (to which I added pears), but the batter comes together quickly. I used pears the first time I made it. They were there and turning brown, and for whatever reason I hadn't gotten around to poaching them like I had initially planned. While I can't pick out the pears in the topping, I want to believe that it adds more flavor than just apples alone. Most recipes I found, including this one, slices the apples, but after trying it that way once and trying it again with cubed fruit, I prefer the cubes. Besides being easier to slice, the cubes caramelized more evenly than the slices. 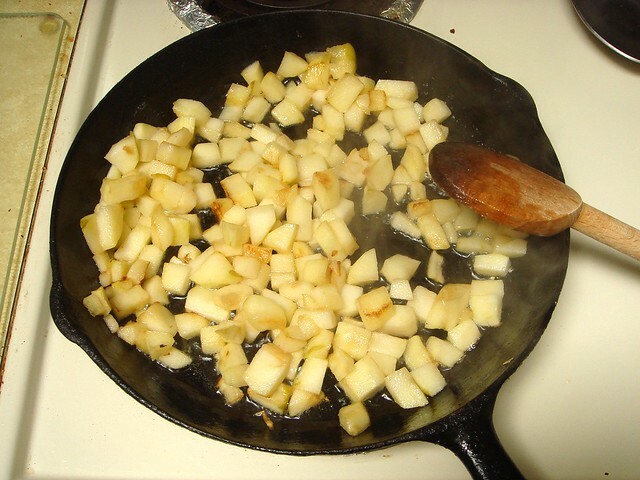 Half of the chopped fruit gets caramelized briefly in butter. I tend to add the apples first as they are firmer than the pears. 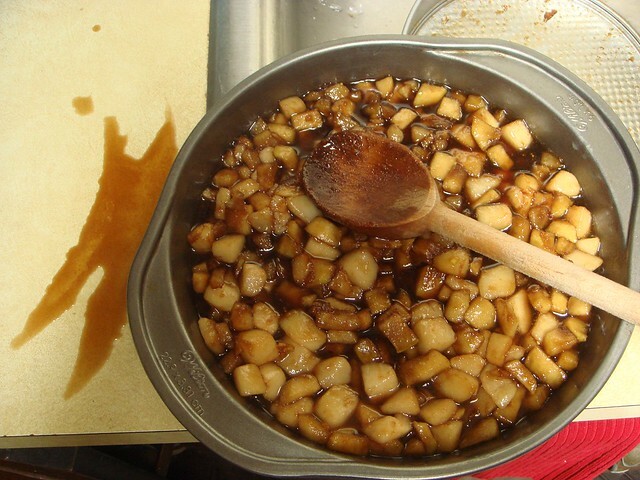 Finally, the remaining fruit, along with brown sugar and lemon juice, are added and cooked until the topping gurgles and thickens slightly. Springform pans scare me. Why, you ask? Because it's not a solid pan, there's always a chance that liquid will seep out no matter how tight the two pieces are latched together. That is you see happened here. I quickly took a similar sized cake pan out from under the cupboard, buttered the inside, and poured in the apple-pear topping, noting that it came about halfway up the sides. The topping is tasty, but it's the cake that really does it for me. This quick cake is easy to prepare, adding to the simplicity of this recipe. But for being so quick to put together, the taste is incredible. There is brown sugar, butter, and sour cream. Although the sour cream doesn't taste noticeably tangy, it gives the cake a moist, velvety texture that's incredibly good. 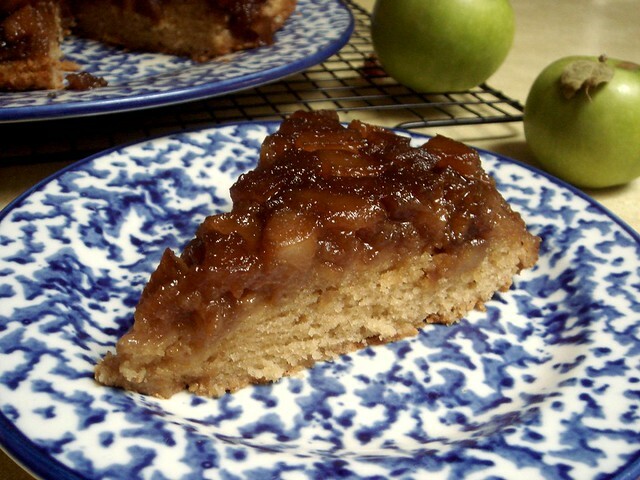 The caramel notes from the brown sugar ties into the apple topping and gives it even more flavor. Back to the pan... There is a reason why the recipe calls for a 2-inch deep cake pan. There was no going back, so I placed the cake pan on a baking sheet and hoped for the best. Fortunately, it didn't spill over at all! This is fall in all of it's glory, people. If you can get in-season apples, please do so. I suggest making this cake anytime you find yourself craving a dessert without all the hullabaloo of a regular cake. Perfect for lazy weekends or time-crunched evenings. Perfectly tasty. 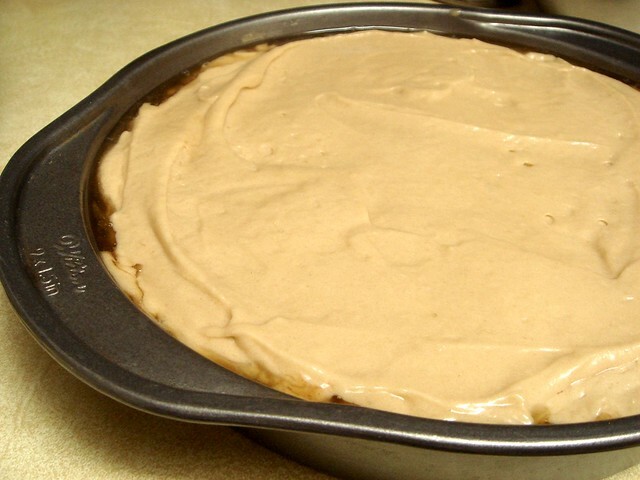 FOR THE TOPPING: Butter bottom and sides of 9-inch round, 2-inch-deep nonstick cake pan; set aside. Adjust oven rack to lowest position and heat oven to 350 degrees. 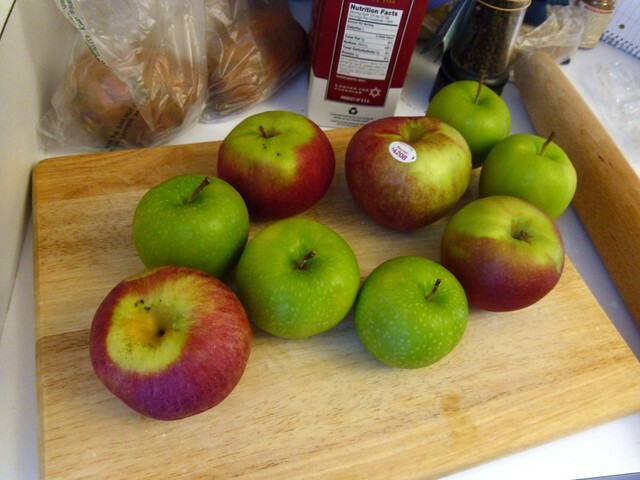 Cut apples into 1/2-inch cubes; set aside. 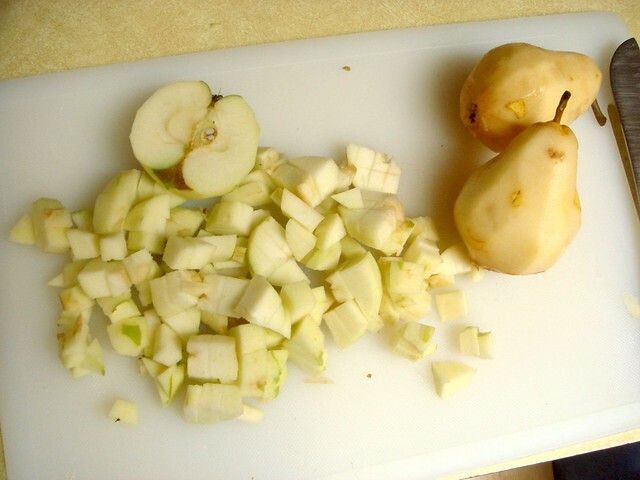 Cut the pears into 1/2-inch cubes; keep separate from apples. Heat butter in 12-inch skillet over medium-high heat. 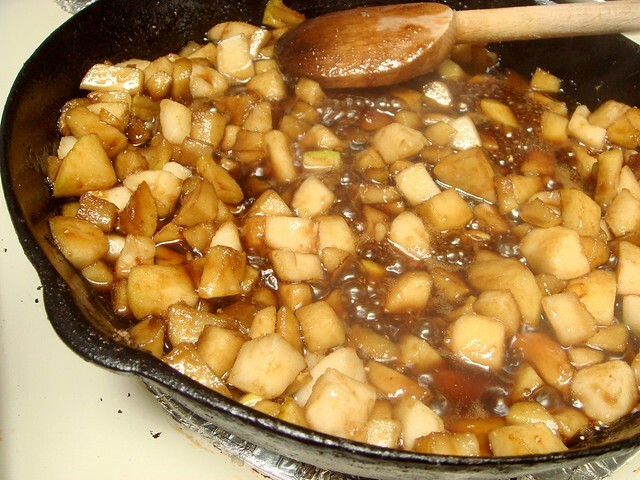 When foaming subsides, add apple cubes and cook, stirring 2 or 3 times, until apples begin to caramelize, 4 to 6 minutes. (Do not fully cook apples.) 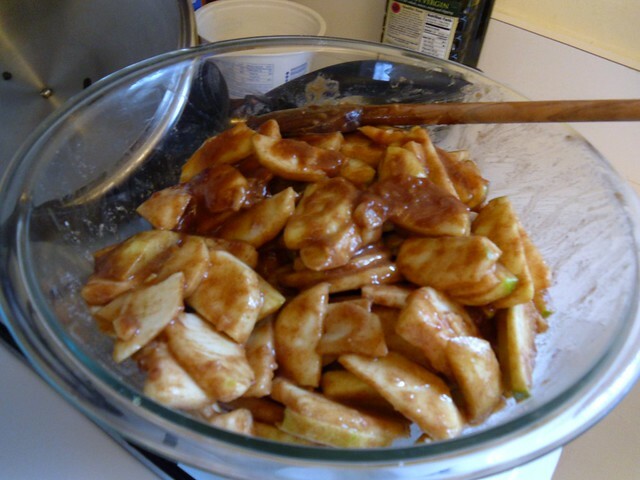 Add pear, brown sugar, and lemon juice; continue cooking, stirring constantly, until sugar dissolves and apples are coated, about 1 minute longer. Transfer apple mixture to prepared pan and lightly press into even layer. Set aside while preparing cake. FOR THE CAKE: Whisk flour, baking powder, and salt together in medium bowl; set aside. Whisk granulated sugar, brown sugar, and eggs together in large bowl until thick and homogeneous, about 45 seconds. Slowly whisk in butter until combined. Add sour cream and vanilla; whisk until combined. Add flour mixture and whisk until just combined. Pour batter into pan and spread evenly over fruit. Bake until cake is golden brown and toothpick inserted into center comes out clean, 35 to 40 minutes. Cool pan on wire rack 20 minutes. Run paring knife around sides of cake to loosen. Place wire rack over cake pan. Holding rack tightly, invert cake pan and wire rack together; lift off cake pan. Place wire rack over baking sheet or large plate to catch any drips. If any fruit sticks to pan bottom, remove and position it on top of cake. Let cake cool 20 minutes (or longer to cool it completely), then transfer to serving platter, cut into pieces, and serve. Probably one of my best pies of all time. The crust cooperated, the filling set up nicely, and the bottom crust was fully cooked! I don't know what my problem is, but I have great difficulty getting the bottom to brown. More on that later. My pie baking adventure began with a trip to Chef Central for supplies. Chef Central is a wonderful store filled with everything a baking and cooking enthusiast could need! I splurged on a really nice rolling pin, though I kept on budget for the rest of the items on my list - 9-inch glass pie dish, pastry cutter, stainless steel bowl (for the pie dough), measuring cup, and fruit peeler. I could have spent all day in there if not for my bank account. I followed Cassie's recipe for spicy cinnamon apple pie. However, I've always had problems with the crust spreading out of shape no matter how long it was chilled, so I decided to leave out the baking powder in her recipe. It worked! Another issue I have when it comes to apple pies is that the apples aren't always tender after baking and the filling is usually runny. 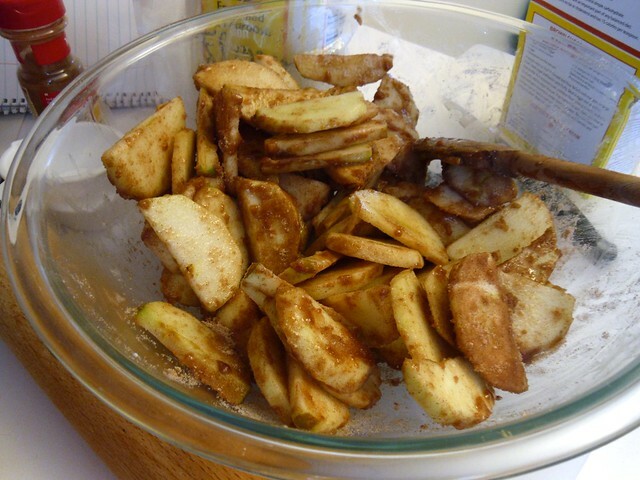 This recipe precooks the apples on the stove just until the slices begin to soften. Because the apples are precooked, I sliced them into 1/4-inch thick slices so that the individual slices would be retained after baking. Since I forgot to buy corn starch, I replaced it with 1/2 cup flour, and I increased the cinnamon to a tablespoon. I brushed the top with a beaten egg and didn't sprinkle any sugar on top, which isn't noteworthy for any reason other than to remember exactly what I did. 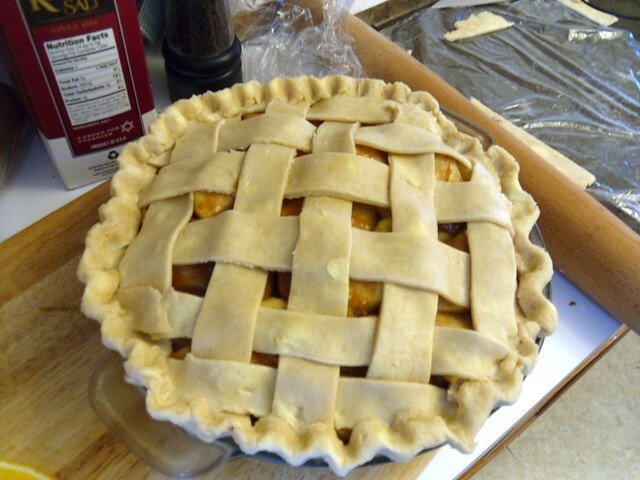 Pro tip to self: Lattice strips need to be longer in order to cover all the apples in this pie. After about an hour of baking, the pie looked wonderful, albeit a bit browned around the edges (I forgot foil). 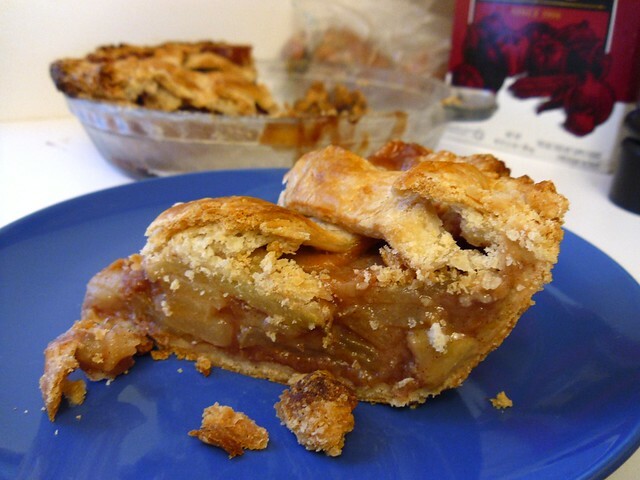 It smelled so apple pie-like that I wanted to slice it up right away; I resisted, and let it cool or a few hours. When it came time for dessert, I sliced into the best pie I've ever made. 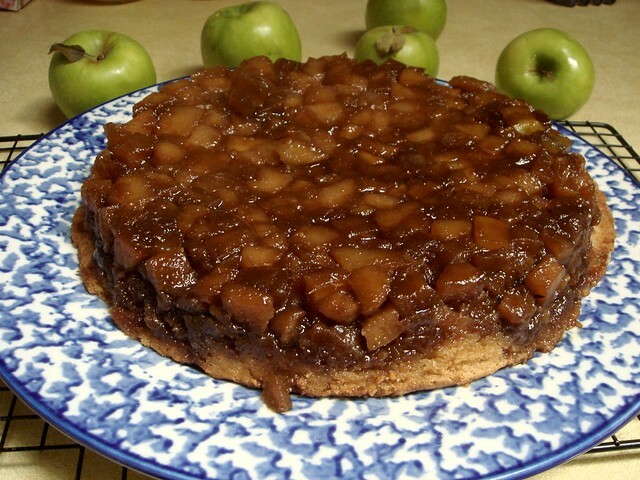 The bottom crust had fully browned, the filling was set, and the apples were tart with just enough sweetness. The crust was crispy and buttery. There are two differences that I feel contributed to the success of this pie. 1. It was baked in a gas oven. I'm not sure if this really makes a difference, but I've baked many a pie in an electric oven, pumpkin, cherry, plum, blind crust, etc., and the bottom never really browns. I've used this same exact pie dough, too. 2. The filling, which was cooked for just a little bit, kept the bottom crust from getting soggy. 3. 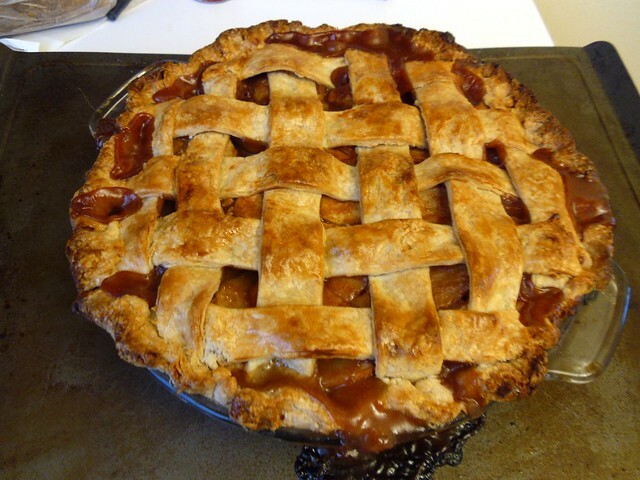 The gaps in the lattice crust allowed moisture to evaporate. I don't really know. This pie received the highest praise from everyone who ate a slice, especially Alex, who said the pie was worth at least $15. So, I highly suggest this recipe to you; you will not be disappointed. Butternut squash soup - although it's hard to find in single serving containers. I usually buy the big carton and then pour it into a jar for work lunches. Congrats, Leanne! 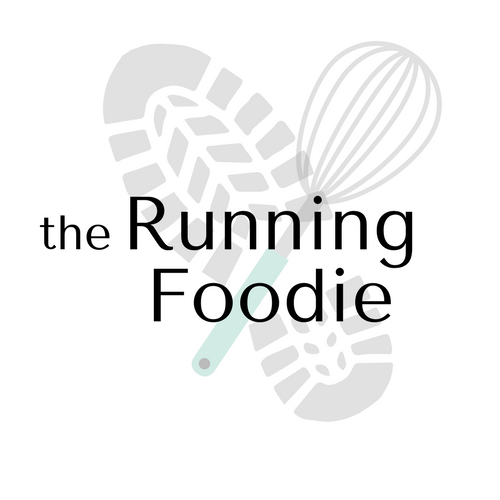 Please email me at christinaATrunningfoodieDOTcom with your shipping info. Have a great weekend, guys. 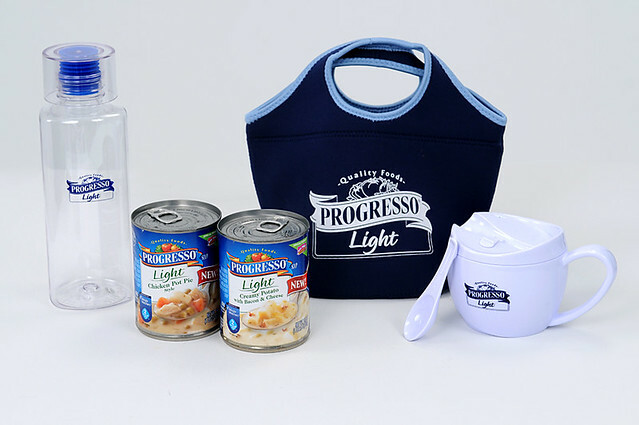 A while back I received this pack from MyBlogPark and Progresso to review Progresso's new Light Creamy Soup. I wasn't too impressed by the soups, honestly, as I need a little more substance in my meals. The consistency was good, but the flavor was lacking. It wasn't bad for a pre-meal snack, or maybe alongside a more substantial entree. In any case, if you guys want to try it out, you can win a prize pack of your very own that includes 2 cans of soup, a lunch pack, a soup mug with spoon, and a water bottle. All you have to do to win is leave a comment with your favorite soup. Please include your email address if it's hidden. Giveaway ends Friday, October 5, and is open to US residents only. Good luck!